Counts money - either stacks of banknotes. Determines whether banknotes are genuine. 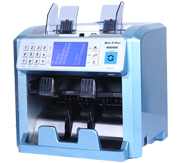 Reliable and efficient banknote processing. We aim to provide our clients with real solutions to help them adapt to the rapidly changing environment of the technology industry. To provide a complete line of total lifecycle support services, designed to complement the needs of technology-driven companies, and add value to their business operations, products and services.